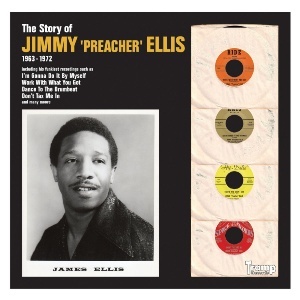 Jimmy Preacher Ellis was born in 1935, in the rural farming community of Foreman, Arkansas. Like most youths, his first singing experience came in church, where he and his brother both sang. By 1950 Ellis had moved to Seattle, Washington where he began singing in the choir at the nearby Mount Baker Baptist Church. Eventually his vocal talents came to the attention of the Reverend F.F. Billups who asked Jimmy to join The Traveling Four, since their baritone singer had just quit. By 1955 The Traveling Four split up, and Ellis, now 20 years old, entered the military service. By the late 1950s, he was back in Seattle and began to seriously pursue his interest in playing the guitar. In spite of his developing instrumental skills, Ellis wasn't quite ready for a solo career. Instead, he recruited former ex-Traveling Four members, Tony Harris and Billy Marshall, to form a doo-wop group called The Centuries. Finally, in 1964 Ellis became a solo blues act, and a legend was born. Ellis took the road south to Los Angeles in hope of doing some recording. In the same year he released his debut 45rpm single under his own name. After that he got introduced to Ferdinand 'Fats' Washington who, by this time, had already garnered a well-deserved reputation as one of the finest R&B songwriters in the business. Washington started his own label called Movin' in the mid 1960s on which Ellis recorded a pair of 45s. Soon later two additional Ellis singles appeared on Ride, another of Washington's record labels. In 1969 Ellis hooked up with producer Mel Alexander, recording a number of sides for his Kris and Space labels well into the 1970s. And this is it, the fourth release in „The Story of“ series on Tramp Records. All these songs have been originally released on 45rpm single only and most of them are available for the first time since its release 40+ years ago. From the detailed liner notes to the classic packaging, you can be assured of the refined taste and heartfelt care that went into this entire production.